Create small nymphs, larvae, pupae and scuds. Build streamer bodies, heads or bigger shrimps. Some flies just need a little bit resin finishing. A high quality clear finish lets you use other material under the resin. Gulff UV resins are always 100% tack-free. Made by using high quality resin material which cures in few seconds. 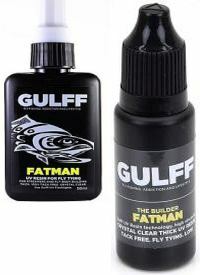 Gulff Classic is the best option for small fly body building and general nymph bonding. Recommend for larvae, pupae, nymphs, scuds and small detail bonding. One of the best clear UV resins in the market. 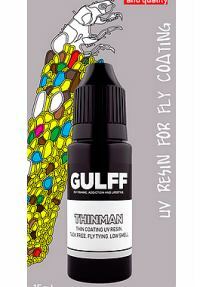 Gulff Fatman is the option for large fly bodies. It is also thick enough for shaping. Recommended for streamers, fly heads and large shrimps. 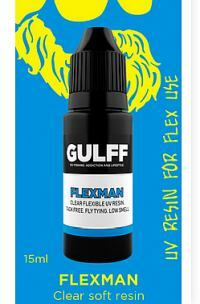 Gulff Flexman is the best option if you need Classic medium viscosity resin features but flex and soft finishing. It is very strong, flexible and soft. Remember that predators have large and strong teeth. For that reason Flexman is not too soft. THINMAN resin, almost like a varnish. Thin but not too thin viscosity for beautiful finishing. It does not cover or fill fly detail. It highlights the detail.